← My Methods of Self-Preservation – are they working? 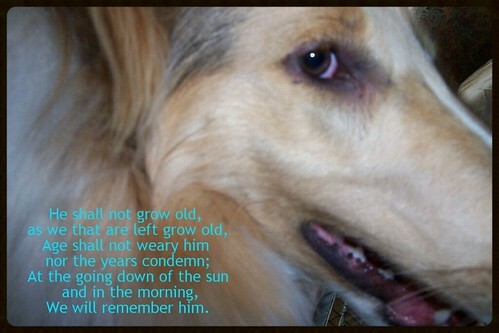 The partial poem on Kip’s photo was taken from a poem by Robert Laurence Binyon, with a couple of pronoun changes for my purposes only. published in The (London) Times newspaper on 21st September 1914. The poem was written in mid September 1914, a few weeks after the outbreak of the First World War. During these weeks the British Expeditionary Force had suffered casualties following its first encounter with the Imperial German Army at the Battle of Mons on 23rd August, its rearguard action during the retreat from Mons in late August and the Battle of Le Cateau on 26th August, and its participation with the French Army in holding up the Imperial German Army at the First Battle of the Marne between 5th and 9th September 1914. Laurence said in 1939 that the four lines of the fourth stanza came to him first. These words of the fourth stanza have become especially familiar and famous, having been adopted by the Royal British Legion as an Exhortation for ceremonies of Remembrance to commemorate fallen Servicemen and women. Laurence Binyon was too old to enlist in the military forces but he went to work for the Red Cross as a medical orderly in 1916. He lost several close friends and his brother-in-law in the war. Lovely! What a nice tribute. Thinking of you and Paul Bex.